The epitome of a high B+ scotch in my book. A quintessential Speyside that will probably always occupy a place on my shelf. A solid whisky – classic. It has been awhile since I’ve put pen to paper, or keystrokes to computer keyboard, and I’m ready to dive into a series of reviews on The Balvenie Distillery. Six total reviews from this Speyside region distillery are planned. Jeremy and I have tasted and revisited them all a few times individually and with our Proper Pour Whisk(e)y Club. 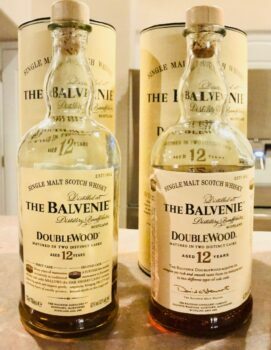 Here is what the next few write-ups will entail: The Balvenie DoubleWood 12-Year Old – a 2014 bottling that has been open for a few years and a newer 2017 bottling (an interesting comparison), The Balvenie 12-Year Old First Fill Single Barrel, The Balvenie 14-Year Old Caribbean Cask, The Balvenie 14-Year Old Peat Week (2002 Vintage), The Balvenie 14-Year Old Peat Week (2003 Vintage), and The Balvenie 15-Year Old Sherry Cask Single Barrel. 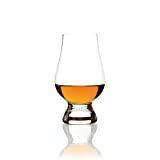 The Balvenie Distillery located in Dufftown, Scotland was established in 1892 by William Grant, and today is owned by William Grant & Sons – an independent, family-owned company. Glenfiddich, established in 1886, was created by William Grant a few years before Balvenie, and it is also owned by William Grant & Sons. The two distilleries are located next door to each other. I will not list all the distilleries William Grant & Sons own here, but they are also the proprietor of Tullamore D.E.W. in Ireland. The Balvenie Distillery grows its own barley on the Balvenie Mains 1,000-acre farm, which makes up a small portion of their needs. They still operate a working malting floor to produce a minimal portion of their annual malted barley requirements (a rarity for distilleries today). In addition to an onsite cooperage, Balvenie Distillery has the longest serving Malt Master in the industry, David Stewart. He started working at the distillery at age 17 (fifty-six years ago). Balvenie ranks, as of 2016, in the #8 spot for world market share amongst Scotch Malt Whiskey brands and has a capacity to produce 7,000,000 litres of alcohol annually. DoubleWood 12 was launched in 1993, using a process designed by our Malt Master David Stewart in 1982, now commonly known as ‘wood finishing’. and one from 2017. I thought it would be interesting to compare the scores on an open 2014 bottling (had been open for about 3 ½ years) to a brand new 2017 DoubleWood 12 Year Old bottle. We have scored the 2014 bottling seven different times between us in the Proper Pour Whisk(e)y Club– twice known for me and twice completely blind; for Jeremy, he tasted the 2014 known twice and blind once. 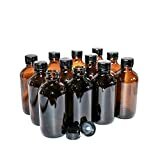 The 2014 DoubleWood bottle was tasted in August 2014 (known), March 2015 (blind – randomly selected in four ounce sample bottle), September 2015 (blind again – randomly selected), and again in January 2018 against the new 2017 bottling – both were known. For the first three tastings listed above [Aug 14, Mar 15, and Sep 15] of the 2014 bottling it was tasted and scored 10 times by 7 different people in the club (I for example tasted it all three times). The average of those 10 scores was 87.7 points (rounded from 87.67 – you’ll understand the reasoning for the detail here later). Club members had not interacted with the 2014 bottle for 28 months before we tasted from the last third of the bottle again this past January. No one in the group knew the previous group average (just not something that you’d remember from nearly 200 scored whiskies). Six tasters scored the 2014 bottle this time (and two of them were new members since the previous tastings). The six gave the bottle that had been open for three years an 87.67– no kidding. When we were all done I looked up the previous scores and we were somewhat shocked. Talk about consistency for a bottle. The new 2017 bottling scored by the same six tasters came in at an 87.83 for the evening. Those two bottles finished second and third for the tasting that evening out of nine whiskies (the number one will be reviewed later). 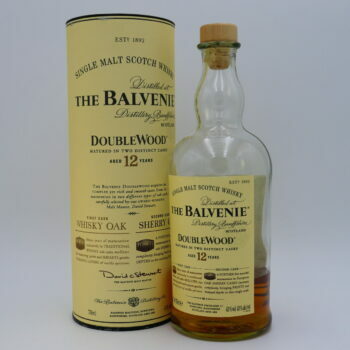 I’ve noted several times in talking with people about whiskies that The Balvenie DoubleWood 12 Year Old is the epitome of the 88 – B+ rated whisky and these two bottlings have not altered that sentiment. The DoubleWood plain and simple is the measuring stick for me now of an 88 point scoring whisky. Back to the averages – for just Jeremy and I on the 2014 bottling – from four tastings it came in at 88.1 for me and 87.8 for Jeremy. The 2017 scored (after one tasting) an 88.0 from me and an 88.5 from Jeremy. So, in this instance the difference between the 3+ year open bottle versus the new bottling was negligible in the ratings. We do not normally put the scores in the review until after the tasting notes, but there was a lot to tell this time on the background of how we got to the scores for this whisky. On to the notes. As always – the notes you see below were written and the bottle scored prior to any discussion by Jeremy and me of what we nosed, tasted, or felt overall, about the dram in consideration. The 2014 and 2017 bottling specifics will be annotated below where appropriate. THE BALVENIE DOUBLEWOOD 12 YEAR OLD : One of my first-ever scotches and still one to keep around – a classic single malt from the Speyside region. Nothing that will blow you away, but definitely something to start your collection with or add to your shelf. Reasonably priced for what you get. (WJ). Not overly complex or impressive, but enjoyable for the price. Slight one point edge to the new bottle (JR). Next up is The Balvenie 12 Year Old Single Barrel – and I promise it’ll be a shorter review. Since earlier in this article I touched on Tom Petty and the Heartbreakers there is not a better way to end this review than with some more of his lyrics: But listen honey, wherever you are tonight, I wish you the best of everything in the world, and I hope you found – whatever you were looking for. And while you’re looking, take time to enjoy the journey with a nice dram – maybe a Balvenie DoubleWood 12 Year Old. Cheers.